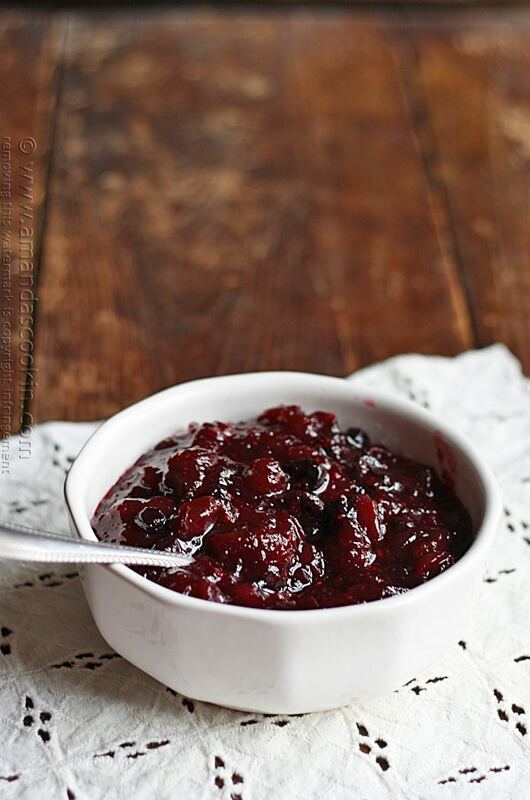 Growing up I never liked cranberry sauce. The jellied, can shaped wiggly thing that the grown ups sliced into discs just did not appeal to me. 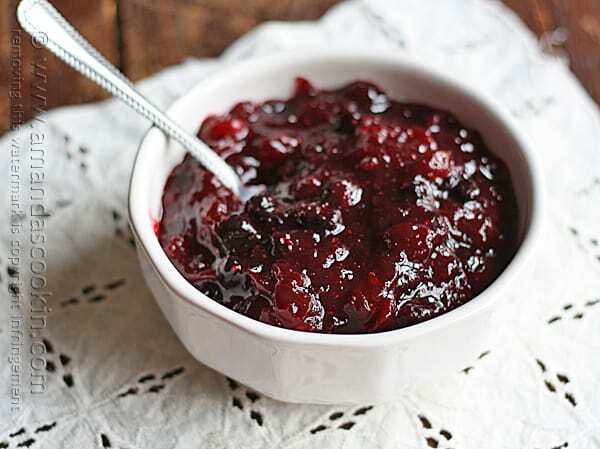 In fact, I carried that into adulthood and really have never enjoyed cranberry sauce at the holidays. However, having this food blog and being introduced to so many different foods and methods of preparation, I have found that I like a lot of things I didn’t like as a child. This will be the first year I’ve ever made cranberry sauce with my Thanksgiving turkey or Christmas ham. I’m happy to say that I’ve put together a recipe that is not only delicious, but would also make a great cobbler or mini hand pies! And, it’s beautiful. It looks so pretty in the bowl, and you can make it in less than 20 minutes. Of course, it will need to cool, and making it the night before is probably your best bet. One less thing to worry about on the big day. 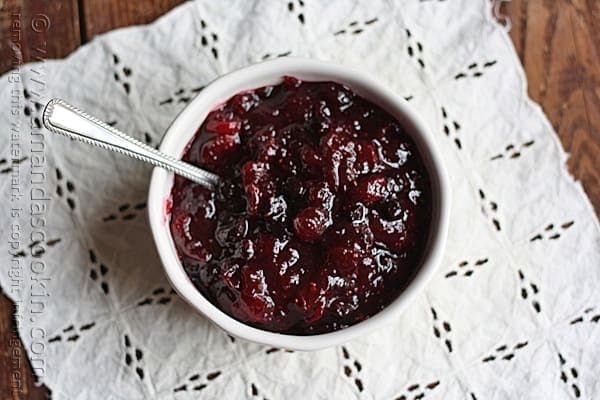 Whole cranberry sauce recipes are actually pretty basic. The most basic one I saw uses water, cranberries and white sugar. The end. There are others that use only orange juice as the liquid, and some that add in spices, or lemon or orange zest. I took bits and pieces of several different recipes and made one my own. 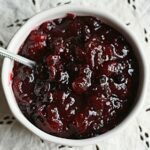 The small amount of blueberries in this recipe do two things: add a richer color and a small amount of sweetness to compliment the tartness of the cranberries. If you’d like to share, click to tweet this holiday favorite to your friends and followers! If you follow along with my on Instagram, you may have seen this bubbling away! A bunch of step by step photos are not necessary for this recipe, it’s that easy. You’ll simply combine the two sugars, water, orange juice and spices and bring it to a boil. Next you’ll add in the cranberries and adjust the heat to medium-high. After several minutes you’ll start to hear the cranberries pop. If they are splattering you, the heat is too high. You need a gentle but steady boil. After the popping noise stops, set the timer for five minutes. The mixture should begin to foam as is bubbles. When the timer goes off, add the blueberries. Cook for another five minutes and remove it from the heat. It will thicken as it cools. When cool, store covered in the refrigerator until ready to serve. Stay tuned, I’ll have a new stuffing recipe coming shortly and a great idea for using up those Thanksgiving leftovers too! Meanwhile, here are some of my all time Thanksgiving favorites. Oh, and there hasn’t been a Thanksgiving that’s gone by without my Homemade Baker’s Square French Silk Pie! 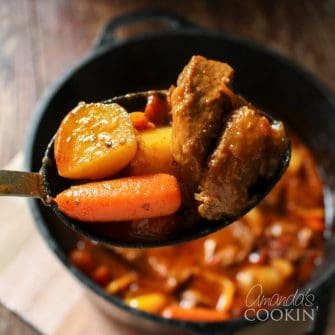 Over medium-high heat in a heavy saucepan combine the two sugars, water, orange juice, cinnamon and nutmeg and bring to a boil. 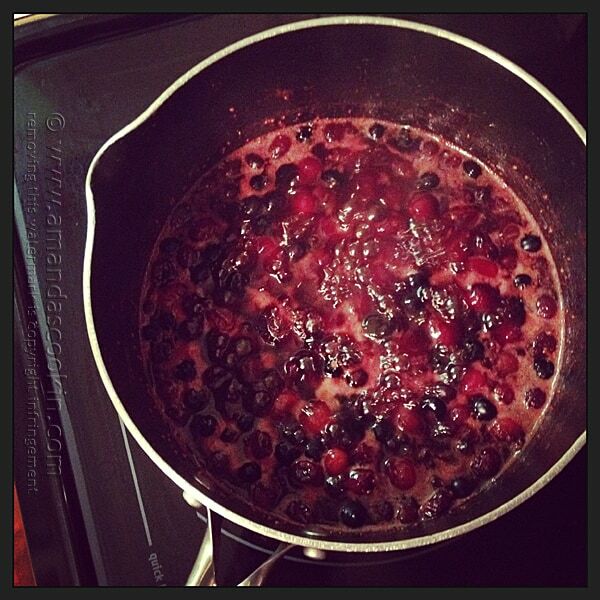 Add in the cranberries and adjust the heat to achieve a low boil. After several minutes you’ll start to hear the cranberries pop. If they are splattering you, the heat is too high. You need a gentle but steady boil. After the popping noise stops, set the timer for five minutes. The mixture should begin to foam as is bubbles. When the timer goes off, add the blueberries. Cook for another five minutes and remove it from the heat. The mixture will thicken as it cools. When cooled completely, store covered in the refrigerator until ready to serve. If your cranberries are frozen, there's no need to thaw them. I just made this today. The first batch I made I followed your recipe exactly and it tasted fantastic. The second batch I made, I added some maple syrup and in addition to frozen blueberries, I also added dark cherries and blackberries. THAT was just as good. Thanks for the recipe! 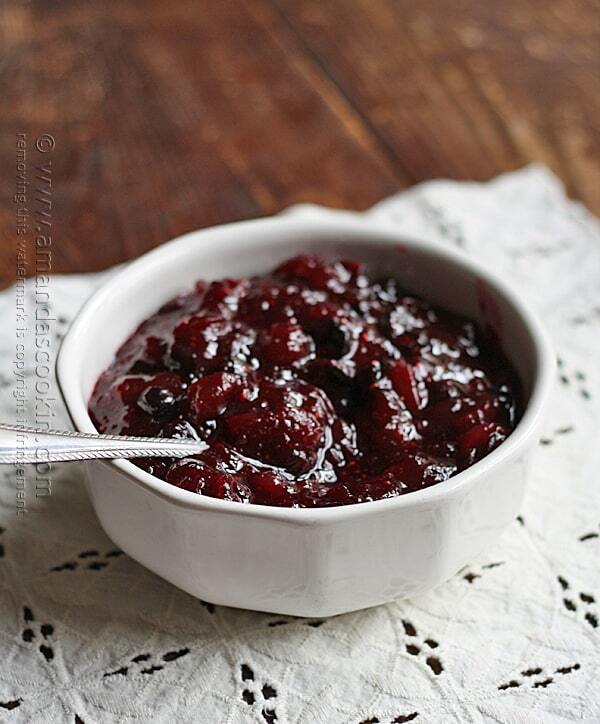 I’ve never made cranberry sauce before! Love your additions! Happy Thanksgiving! How much water to add? I didn’t see it in the recipe. Thanks. I’d like to make this for my dad. he’s the only one in the family who likes whole cranberry sauce! 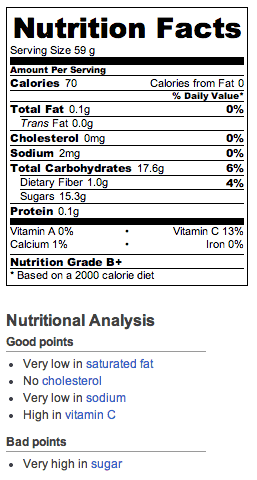 I like the idea of adding blueberries, will have to try that! One of my favorite parts of Thanksgiving and always homemade, there is no comparison. Love it on my turkey sandwiches too. Thanks Cathy! There’s a sandwich shop in Vegas called Capriotti’s that makes a turkey, stuffing and cranberry sandwich that is amazing!